medium to heavy weight fabric for outside - I used a fabric napkin from Crate & Barrel. Decorator fabrics work well, too. VERY IMPORTANT: Wash, dry and iron all fabrics before continuing. 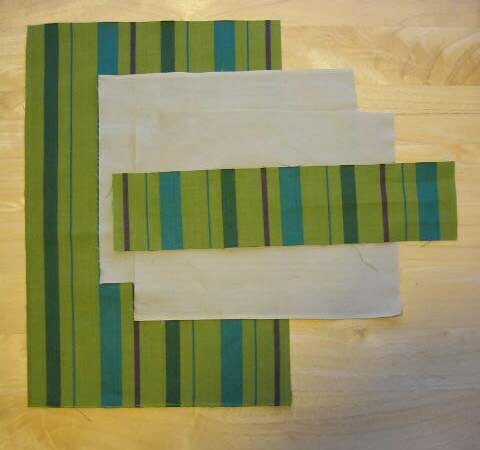 NOTE: if your fabric has stripes or a directional print be mindful of how you cut your rectangles. Think about which direction you want the stripes to go on both pieces of the wristlet and cut your pieces accordingly. 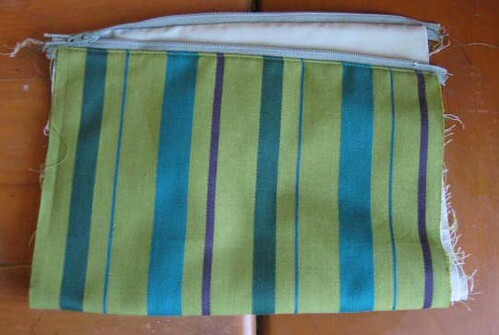 For my wristlet, I'm making the stripes vertical on both pieces of the wristlet. 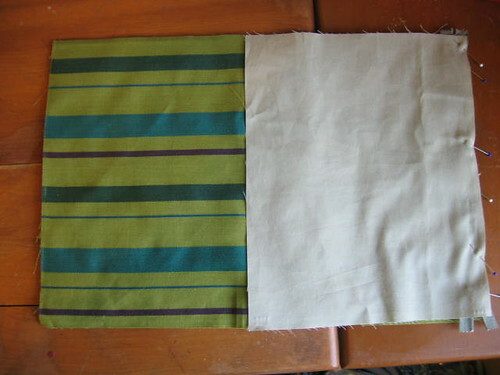 The following pieces will result in a wristlet with veritical strips on both pieces of the wristlet. The strap is going to be made just like a piece of double-fold bias tape. 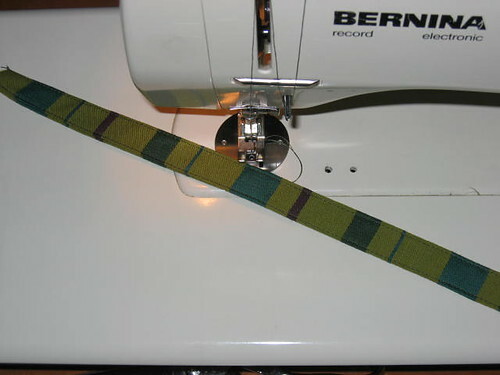 To make the strap, lay the 3" x 13" rectangle wrong side up on your ironing board. Fold the rectangle in half, wrong sides together, so that you have a 1.5" x 13" rectangle. Iron it. Unfold it. There should be a crisp crease running down the length of the rectangle. Fold the raw edges in to meet the crease. Iron it again. 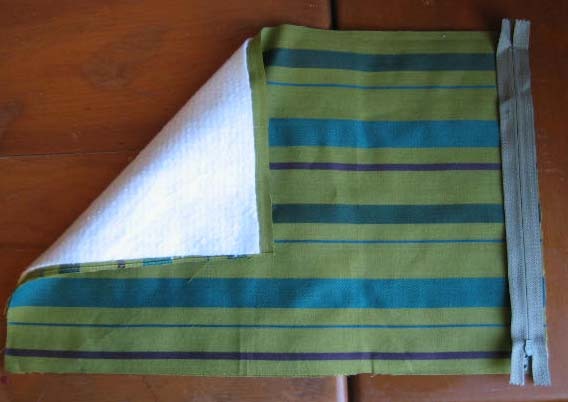 Fold in half along the crease so that you have a .75" x 13" rectangle. Iron some more. Stitch both long edges of the rectangle as close to the edge as you can. Clip all threads and set aside. Lay the quilt batting out flat. Place the 10" x 15" rectangle, right side up, on top of the batting. Place the zipper, wrong side up, on top of the fabric and batting. Line up the top edges of all three layers and pin them together. Place one of the 10" x 8" rectangles on top, lining up the top edge with the bottom layers. Pin all layers together and sew together, using a 1/4" seam allowance. 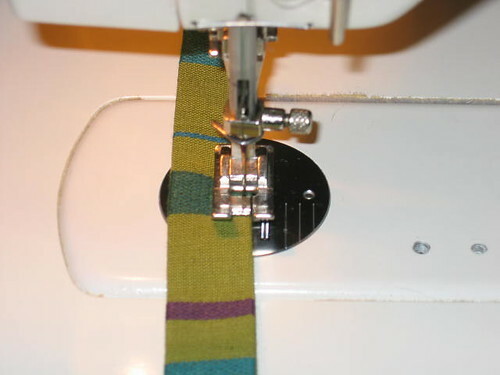 You may need to stop sewing and move the zipper pull once during this seam to maintain an even 1/4" seam allowance. If the seam isn't even, try again until it is. Trim the quilt batting as close as possible to the seam, being careful to not cut any of the fabric. Trim all threads. 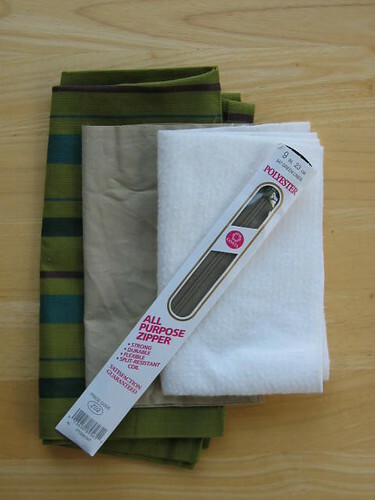 Fold the outer fabric and lining away from the zipper and iron. Top stitch the outer fabric to the zipper. Do not top stitch the lining to the zipper. Open the zipper and turn the wristlet inside out. Pull the lining to one side of the zipper and the outer fabric to the other side. 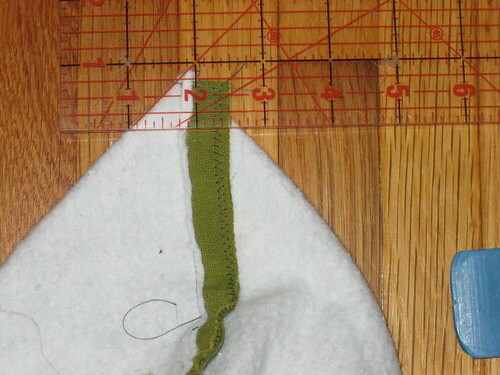 Using a 1/2" seam allowance, sew the two pieces of lining together. 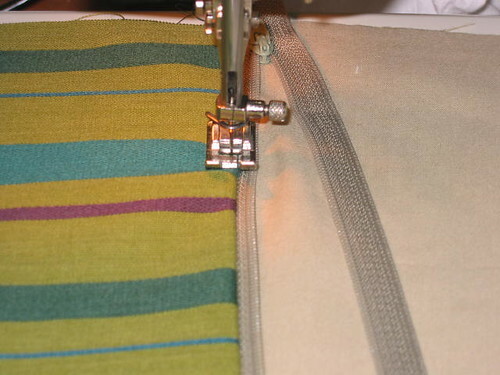 Be careful NOT to catch the zipper or outer fabric while stitching. Leave a 4" opening in the side of the lining. 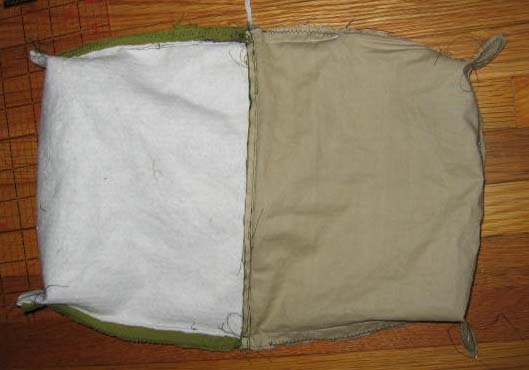 Fold the strap in half and place it between the two layers of outer fabric, about 2" away from the zipper with the raw edges of the strap with the raw edges of the outer fabric. Pin the strap in place. Sew (again, using a 1/2" seam allowance) both sides of the outer fabric and batting together. Trim the batting as close as possible to the seam. Reinforce the stitching around the strap. Zig zag around the raw edges (leaving the 4" opening open) to keep them from fraying. Take one corner of the lining and fold it so that the bottom seam matches up with the side seam. Take a ruler and draw a line one inch from the point. Stitch along the line. Repeat for 3 remaining corners of wristlet. 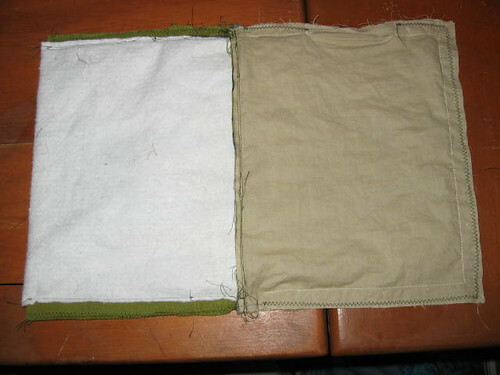 When all 4 corners are done, turn your wristlet right side out by pulling everthing through the 4" hole in the lining. Make sure that the corners are even. 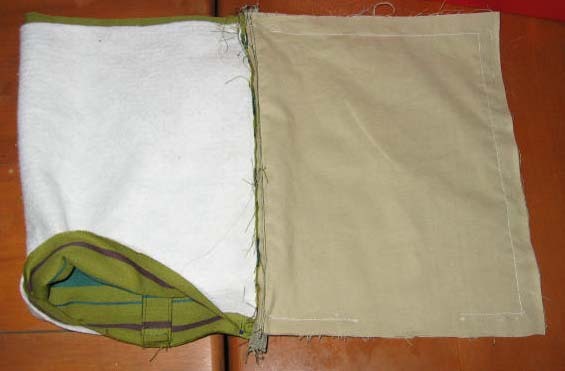 Once the corners are even, cut off the extra fabric at the corners. Iron, iron iron. 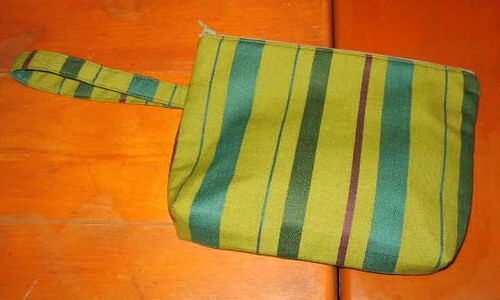 Turn the wristlet right side out, hand-stitch the 4" opening closed, give it one final ironing and you're done!! Please let me know if you have any questions or comments - any feedback is welcome!! I used this tutorial on craftster as reference and inspiration. This post is my entry into the GIFT category for the December whiplash competition. i've been wanting to learn how to sew one of these for so long. thank you! Thanks for this tutorial! It was very easy to follow, and the pics were great. I made it a bit smaller (7" x 5"), put a pocket on the inside, and it turned out really nice. I've just was looking for a pattern for this...and came across your site. Just finished mine...thanks so much! Your tutorial was easy to follow. Thanks again! !